These provisions apply to all URL and field names registered by Circuit Cellar, Inc. (hereafter called “Circuit Cellar”). Circuit Cellar may amend this policy at any time, with or without prior notice. By accessing Circuit Cellar’s web pages, you agree to the following terms and conditions. If you do not agree to these terms and conditions, do not use this site. Although the products offered on this website have been developed with great care, no liability is assumed for any error, loss or damage caused by their use. Typing errors and price changes reserved. 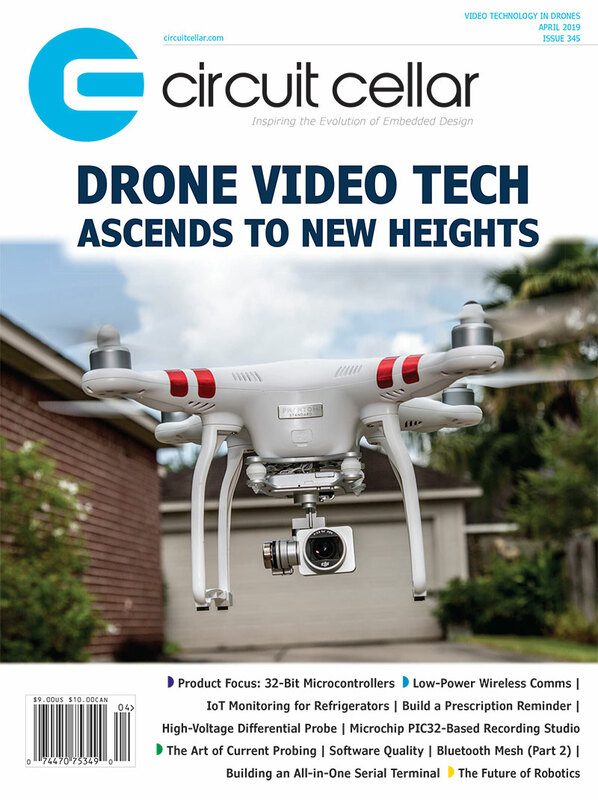 Circuit Cellar’s Digital 2.0 and Combo 2.0 Subscribers are encouraged to download their issue/article PDFs of the magazine as soon as possible. New issue/article PDFs will remain posted for a period of 90 days. Circuit Cellar is not liable for subscribers who do not download the issue/individual article PDFs within the 90-day download timeframe. Circuit Cellar holds the copyright to the content of the Circuit Cellar web pages. All rights not expressly granted in these conditions are reserved. The content, either in its entirety or any part thereof, may not be reproduced, transferred, distributed or stored in any form without Circuit Cellar’s prior written consent, with the exception of the following. Use of this site and its content is permitted for personal, non-commercial purposes only. Use of press releases and other documents classified as public may be used in publications in the public domain provided that the source of the information is expressly cited. This site and the content thereof are available for you to use at your convenience. Circuit Cellar reserves the right to make changes to or to refuse access to these pages. Circuit Cellar provides these pages on an “as-is” basis and makes no representations or warranties vis-à-vis the availability, accuracy, reliability or content of these pages. Circuit Cellar can in no way be held liable for any direct, indirect, incidental, special or consequential damages, or loss or business interruption resulting from the use of or the impossibility to use the information supplied through the World Wide Web pages, even if Circuit Cellar has been informed of the possibility of such loss or damage. To make access to other sites easier, Circuit Cellar may include links to sites owned and managed by third parties. When you use a link to visit such a site, you acknowledge that Circuit Cellar has no authority concerning the content of that site and that Circuit Cellar accepts no liability for material made and published by such third parties. Moreover, while Circuit Cellar includes links to other sites, Circuit Cellar does not endorse those sites or the products or services mentioned on them. If you send digital material to one of our servers, for example, by means of e-mail or Circuit Cellar’s Web pages, specify that: (a) the material neither contains illegal items nor is otherwise unsuitable for publication; (b) you have done everything possible to ensure that the material sent is free of viruses and other contagious or destructive functions; (c) you are the owner of the material or you are entitled to send it to us, (d) you agree to initiate no legal action against Circuit Cellar concerning the material sent and you will indemnify Circuit Cellar from any liability caused by or arising from a third-party action concerning the material you sent to us. Circuit Cellar does not necessarily control the material placed by users on its site and is not liable for the information it contains. Circuit Cellar is free to remove, at its discretion and at any time, any material sent by users, including forum contributions. Some of the links throughout our site are “affiliate links.” This means that if you click on the link and purchase the product or service, we will receive an affiliate commission. Circuit Cellar only promotes those products or services that it has investigated and truly feels will deliver value to you.